Emmett Till would have turned 76 today, July 25, had a white woman not lied on him. Maybe he would have had a wife and a family. Maybe he would have been surrounded by grandkids celebrating his big day right now—quietly, of course, for none of us would have ever had a cause to know his name. Now, you don’t have to tell me that this is a supposition. But the fact remains that Emmett’s life was viciously cut short in August 1955 in Mississippi by two white men, J.W. Milam and his half brother, Roy Bryant, all because he allegedly whistled at Bryant’s wife, Carolyn. And so we’ll never truly know what would have become of Emmett Till had he not been lied on—had he lived past that day. Earlier this year, Roy Bryant’s wife, now known as Carolyn Bryant Donham after having divorced and married a few times (something not afforded to Emmett, by the way), broke her silence and admitted that she made up the most damning part of her testimony. The 82-year-old confessed about 10 years ago to author Timothy Tyson, a Duke University senior research scholar, who was working on the book The Blood of Emmett Till. Conveniently, Donham claimed that she didn’t remember exactly what happened in the store. But Emmett’s family and much of the world were well aware of what happened to Emmett after she accused him of inappropriate advances. The terrified 14-year-old was kidnapped from the home of relatives by Donham’s then-husband and Milam. Emmett was beaten, mutilated and shot to death before the half brothers sank his body in a local river by tying a 75-pound gin fan around his neck. Meanwhile, more than 60 years later, Emmett’s family is still seeking justice on behalf of their loved one, with his surviving relatives asking for the case to be reinvestigated after Donham admitted to lying on the teen. The Justice Department has flitted around the subject, saying that the case may indeed be reopened once again. Attorney General Jeff Sessions expressed his support for pursuing and prosecuting those involved. However, most black people are skeptical about Sessions’ willingness to truly dig into the old case. Then, of course, there is the currently tense relationship between Sessions and President Donald Trump, which has some questioning whether Sessions will be ousted or maybe even quit. 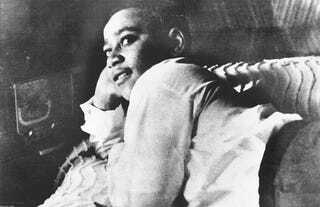 Emmett Till could have turned 76 today ... if a white woman hadn’t lied on him.